Catherine Wheel's song "Black Metallic" was a shot in the arm that made me start listening to music in an entirely new light. This is another one of those "120 Minutes" discoveries, but man, "Black Metallic" was a song that absolutely haunted me. I remember listening to in on a Monday afternoon after school, and then going out to a Homer's Music (Nebraska's mini music chain) to pick up a copy of the album it was on, "Ferment," right after school on Tuesday. "Ferment" is one of the albums I've bought the most over the years - a copy was in the collection of CDs I had stolen from my truck in 1997, a copy was in the collection of CDs I had stolen from my car in 1999, a copy was in the collection of CDs I had stolen from my car in 2002 and the album was reissued in 2010 with a bunch of new material. 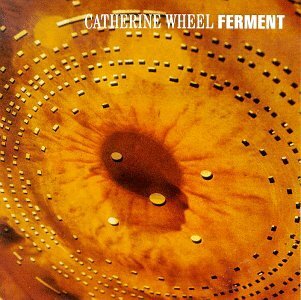 So I've given Catherine Wheel quite a bit of money for this album, and each and every time it's been absolutely worth it. "Ferment" is gothic. It's not goth, but it's got a certain weightiness to it, a density you don't find on a lot of music. The very first song on the album, "Texture," is as advertised. You can practically feel the sheets of guitar work, shimmering like glittering steel in moonlight. This sort of sets the stage for what you're going to get on the album, something best listened to at night if you ask me. It's full of hefty melodies and epic sounds. They aren't quite shoegaze, but you can hear they aren't that far from it. The band didn't like being lumped into the shoegaze genre, but it's easy to see why a lot of critics lumped them into the field - the guitars are truly epic, and dwarf most of the other sounds. But Rob Dickinson's voice is just too prominent for them to be pure shoegaze, and the band constructs songs a bit more traditionally than often falls into the shoegaze wheelhouse.